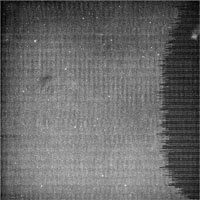 This program will import a PDS Cassini ISS image file into an Isis cube. Some Cassini files available from PDS contain VICAR labels THIS PROGRAM ONLY ACCEPTS PDS LABELS. You must specify an input file which contains PDS labels. Note: Scientists indicate that zeros may be valid DN values for sky areas of CISS images, but missing pixels are also assigned a value of zero and there is no known way to distinguish them. Since the chance of a valid zero DN is so slight, ciss2isis will replace all zeros with Isis::Null. Steven Koechle 2007-05-24 Removed Vicar Support. Added PDS Cassini ISS support. Christopher Austin 2008-03-18 Checks if input file is rdr. Jeannie Walldren 2008-08-25 Modified application to save off binary file header and compute read out order, to save off line prefix data of overclocked pixels with the appropriate overclock average into a table, and to convert compressed 8bit images to 16bit using a look-up table. Added keywords, with units where appropriate, to labels. Jeannie Walldren 2008-08-28 Modified to allow import of images with BandBin filter combinations not found or commented out in the translation *.def files. Previously, this circumstance stopped the program and threw an exception. Application now outputs a warning to the log but still creates the cube. Jeannie Walldren 2008-11-05 Modified FixDns method and updated documentation. Christopher Austin 2010-01-08 Fixed the reading of Pvl labels twice. Tracie Sucharski 2012-05-04 Added error message when input image does not contain Pds labels. 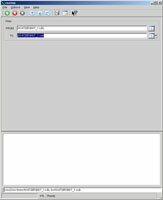 Christopher Combs 2018-01-30 Changed documentation to reflect newly added and unsupported target names in translation files. Fixes #4970. Use this parameter to select the Cassini PDS Image Label. 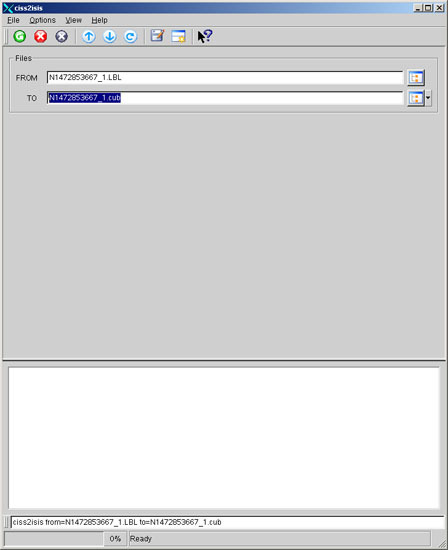 The file must contain PDS labels for Cassini ISS data. This can be a detached label file with pointer to the cube data. NOTE: While we support most Cassini ISS Targets for ingestion, some of the smaller bodies do not currently have support for parameters such as their body radii. Therefore, spiceinit will fail when run on cubes created with these targets. The current list of these target bodies is : ANTHE, AEGAEON, BERGELMIR, BESTLA, ERRIAPO, ERRIAPUS, FORNJOT, GREIP, HATI, HYROKKIN, IJIRAQ, JARNSAXA, K07S4, KARI, KIVIUQ, LOGE, MUNDILFARI, NARVI, PAALIAQ, SIARNAQ, SKADI, SKATHI, SKOLL, SURTUR, SUTTUNG, SUTTUNGR, TARVOS, TARQEQ, THRYM, THRYMR, YMIR. Use this parameter to select the output filename NOTE: The following TARGET_NAMEs will be translated to 'Sky' in the output cube's PVL: SKY, DARK SKY, S8_2004, S12_2004, S13_2004, S14_2004, S18_2004. The use of ciss2isis to ingest PDS images and output Isis3 cubes. This example shows the use of ciss2isis create an Isis3 cube from a PDS image. This is the label from the output cube showing th Instrument, BandBin, and Kernels Keywords imported and the ISS Prefix Pixels Table added. Converts from PDS format to a Isis3 cube.